Robots Love Ice Cream the Card Game, a semi-cooperative family friendly card game for ages 8+, launches on Kickstarter November 13th, from tabletop publishing studio 25th Century Games. The card game is based on the hit video game Robots Love Ice Cream™ by mobile experience studio Dragon Army, also located in Atlanta, GA. The video game was released in 2014 and named one of the best games of the year on both iOS and Android. This tabletop version features all of the same characters and art style found in the video game plus new illustrations only available in the card game version. One to four players travel in their ice cream trucks to five different planets across the galaxy. They must work together to collect matching sets of weaponized ice cream cards and use them to destroy waves of attacking robots. If all of the robots are defeated, Spinston’s plans are foiled, collectively saving that planet’s supply of ice cream treats. 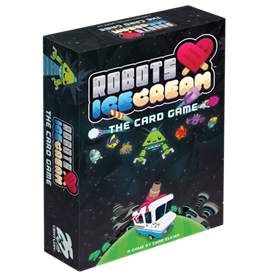 The crowd-sourced Kickstarter campaign for Robots Love Ice Cream the Card Game will help raise funds for the manufacturing costs to produce the game. The campaign will begin on November 13th and conclude on December 14th. To learn more about Robots Love Ice Cream the Card Game, visit the Kickstarter page. 25th Century Games is an Atlanta startup dedicated to publishing entertaining tabletop games and puzzles that bring people together. The company recently published their first project, a 1000 piece puzzle featuring a historic map of Atlanta from 1892. Their focus is designing games and puzzles which are family friendly and are suited for a variety of age levels. Dragon Army, based in Atlanta, GA, is a mobile experience agency built to deliver the best entertainment to mobile devices everywhere. Consisting of a blended group of marketers, game designers, developers and artists, the team applies their diverse skills to create rewarding mobile experiences for the world’s top brands. The company currently partners with The Coca-Cola Company, The Home Depot, Red Bull and InterContinental Hotels Group. Dieser Eintrag wurde veröffentlicht in Crowdfunding, English, Fun, General und verschlagwortet mit Card Game, Kickstarter, Robots love ice cream von Sebastian Trella. Permanenter Link zum Eintrag.